When you are doing a 3D print of a model there are multiple parameters that you have control of and these parameters of the printing process can affect things like quality, durability and speed of the printing process. So you should know what and how to change in order to get a stronger model or a faster print or actually a useable print if you are having trouble printing a 3D model. Infill is a value usually represented in percentage that shows how much a solid model should bi filled in with material when printed. Normally, unless you want maximum strength, you would not need to go for maximum fill of a 3D model, especially if you also want to save on material costs, model weight and want to get the print faster. Going at up to about 20-30% percent Infill is usually more than enough for normal use, unless you want something specific like high fill percentage for optimal strength. When you are not using the maximum fill percentage a special pattern is used to create strong and durable inside support structure. Number of Shells (Outline/Perimeter Shells) is a value that sets the number of outlines printed on each layer of your object, the more shells the stronger the printed object is, so setting a higher number of essentially shells make the printed part with denser outside walls. However you should be careful not to increase that number too much and the visual result may not be that nice. The default number of shells is usually 2 (one is too little) and you should normally not go to more than 5, though you are welcome to experiment. Instead of increasing the number of outside shells of the object you may want to increase the Infill percentage. Layer Height is the main parameter that affects print quality as it sets the thickness of each layer that is being printed. The lower the number, the thinner each layer is, the better quality you get of your 3D prints. However decreasing the layer thickness also means more layers will be needed to be printed and the time required for the 3D printing may get significantly increased. Usually the preset quality level does change the layer height and you can expect something like Low/Fast layer thickness of 0.3mm, Normal/Medium of 0.2mm and High/Slow setting with layer height of 0.1mm. Extruder Temperature is the temperature at which the extruder of the printer needs to be while printing. This right temperature depends on the material used, the standard value of 230 degrees Celsius is usually used for printing using PLA or ABS filament, however flexible filaments usually require lower extruder temperature. So check what are the recommended printing temperatures depending on the print material (filament) you are using for your specific prints. 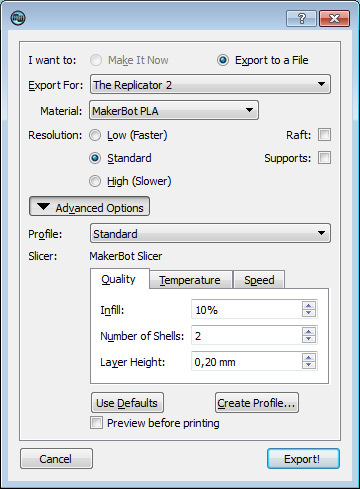 Sometimes you may need to tweak a bit the temperature depending on the model you are printing as the default recommended one may not be doing great, but this is rarely needed. Printing Speed (Speed while Extruding) is the speed at which the printing head moves while extruding the filament to create the physical representation of the 3D model. Depending on the model and the filament you use you may need to lower the printing speed to be able to get good quality prints. Increasing the printing speed may help you get some prints a bit faster than usual, however too much increase of the speed may start to result in bad quality and failing to print 3D models. Movement Speed (Speed while Traveling) is the speed that the printing head moves while not extruding filament, here the speed can be faster than while extruding and normally up to twice the speed while printing is Ok. Normally you should not need to modify the default values for the movement speed as the printer manufacturer probably already selected the best value. There may be some other options available for the control of the 3D printing process, depending on the software you may be using for 3D printing, but these are the main ones you will probably see and need to probably modify. It is not recommended to play with setting that you are not aware of and especially how they affect the 3D printing process as there is even the possibility that you may damage your 3D printed if setting values that are not OK.